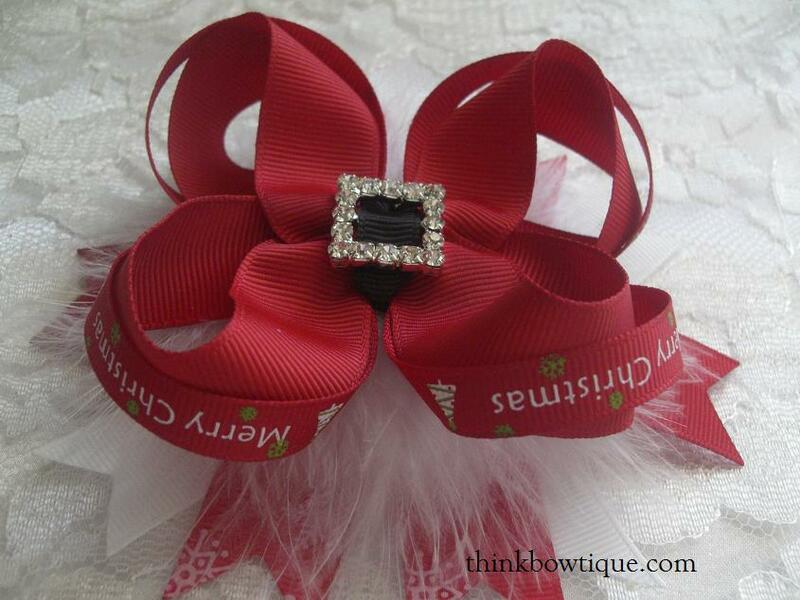 Home » How to make hair bows » How to make twisted boutique bow with 16mm grosgrain ribbon. Think Bowtique has all your hair bow making supplies and Craft ribbon online right here in Australia. This is my first twisted bowtique with 16mm grosgrain ribbon so I have guessed the lengths.This bow is about 9cm wide. You can play with your lengths until you are happy with the finished results. I started with a length 45cm folded in half and put a pin to mark the center. Take one end of the grosgrain ribbon and bring it around to form a loop. With the center of the ribbon on the center of the pin. Do the same with the other side to form a figure 8. I decided to use 2 colours, this will also make it easier to see how it’s made. Do the same to the other side. Now it is important the you have 2 straight lines of grosgrain ribbon as the picture on the back. This is the front you have a X. Through the front of the bow push a needle to give you 2 ridges and 1 valley. This is the back, keep the 2 straight lines. Also my needles looks off. I think the point of the needle should have been a little to the right so it is straight on both sides. It was very hard to push the needle through all the layers. I like to use crochet thread to tie my bows, I wrap the thread so one it sits on opposite sides of the needle tie double loops and pull tight, turn over and do the same than 1 single knot. I then like to pull the thread through and tie it off. This way if you pull on a loop it will not come apart. Now to make the spikes. You will need at least 5 piece of grosgrain ribbon. I used 7 x 10cm. Fold in half cut on the angle and seal with a flame. If you use a burning tool the 2 sides will glue together. Lay out your spikes how you want them to look. I find if I lay them on my mouse pad they don’t slip as much. Now pick them up. I hold down the center with my thumb and slip my finger under the back to pick up. Feed your need through the same as the bow. Here’s a pic of the ribbon with the double loop to tie. Pull through your need to tie off. Here is the spike bow. If some of your spikes are out you just cut and reseal. Now for some secrets. If you want your bows stiff and crush resistant. Spray with ironing startch. Place them like this in a cold oven 110 for 25mins. DO NOT PUT THEM IN THE OVEN AFTER YOU HAVE GLUED THEM. For the surround. I used a 9mm 47cm length of grosgrain ribbon fold in half, pin than fold each of the side in half and pin. You will have 4 even lengths. Take one end and bring it around to form a loop. The ribbon will sit next to the pin on the outside. Then fold the next pin around and sit on the other side of the pin. Hot glue in place as you go. Do the same until you have 4 loops. I have sat the pins to help show where to sit your ribbon. You should have 4 loop like this. Sit your bow inside your surround loops. Adjust until your happy and then pull one side down and hot glue in the middle. Here is a side view, you can hot glue your surround to the side if you wish. You can Bling it by adding a rhinestone button center or maybe a small bow on the side with a flatback rhinestone or flatback pearl. I have tweaked how I make this bow view my latest post how to make a twisted boutique hair bow. I think the new method is much easier. This is how I make my bows. I am not saying it’s the best, try it and see if it works for you. If you would like to share this post please link back to us and use 1 photo only. DO NOT COPY THE WHOLE POST.